By contrast Stompers were focussed from the word go and their determination was well illustrated by the storming carries of the returning lock, John Ellul. They burst into Overseas territory from the kick off, and nearly scored after a sweet grubber from Camilleri. However a huge drop out by Du Toit with the strong wind took Overseas deep into the Stompers territory , Rulli nearly broke through for a try until he dropped the ball, but a penalty was awarded, Overseas chose a scrum and the ball was sent along the line to Du Toit whose hand off dropped Attard and he powered in for a try, which he also converted. Two penalties through over excitement cost Stompers ground, Overseas launched from the lineout until a poor pass to Du Toit away possession. Stompers won the ensuing ruck, distributed right and Cerketa made a superb long pass to Attard to switch the attack to the left, Camillieri made a half break then passed to nobody to waste a promising move. A fine drive by Stompers scrum rubbed in their growing superiority as they took the ball against the head. They had the better of most line outs throughout the game, which makes a big difference in quality of possession. Overseas attacked again but were foiled by a super gather by Cammilieri off a Gibson chip. Stompers were leaking penalties and yet another gave Du Toit to score from a quick tap, despite having his shorts pulled down. Just as it looked as if Stompers energy was being sapped they conjured a good try as a huge morale booster. Ellul and Alvarez combined off the back of the lineout, Debattista carried on and released Camilieri who was too powerful for full back Boland. Attard converted with a wonderful kick against the wind. Stompers were doing well against the gale but Overseas kicking was inconsistent. However Overseas concentration was lacking and many times their passing was sloppy flat footed and few players were running onto the ball positively. Stompers won good ball by their passionate commitment, which ensured that they were playing off the front foot, whereas Overseas were mostly on the back foot through a lack of interest, and giving away valuable footage time and again. At half time the score was 12-7 to Overseas which was a very promising situation for Stompers considering they had been playing against a strong wind. 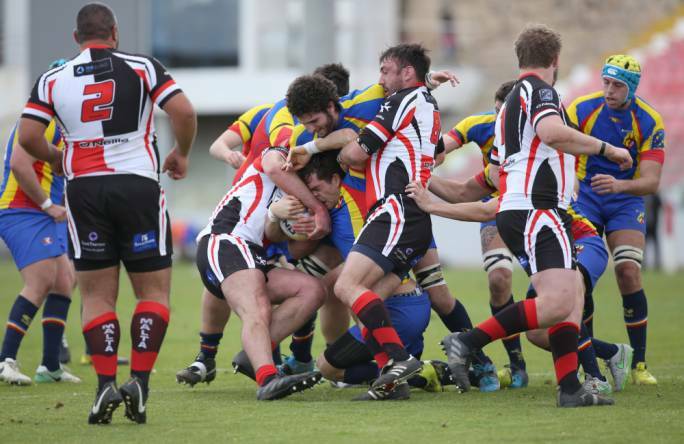 Overseas began the half with a sustained attack but failed to score and then a huge defending kick by Attard took Stompers 70 metres upfield, from the ensuing lineout Stompers drove near the line, Attard drove forward, fed back and Camillieri broke through to score, Attard converted to take the lead. Stompers tails were really up and fromanother scrum they sent tha ball along the line to Pavanello, who showed his class and speed by simply swerving around two defenders, again Attard converted. 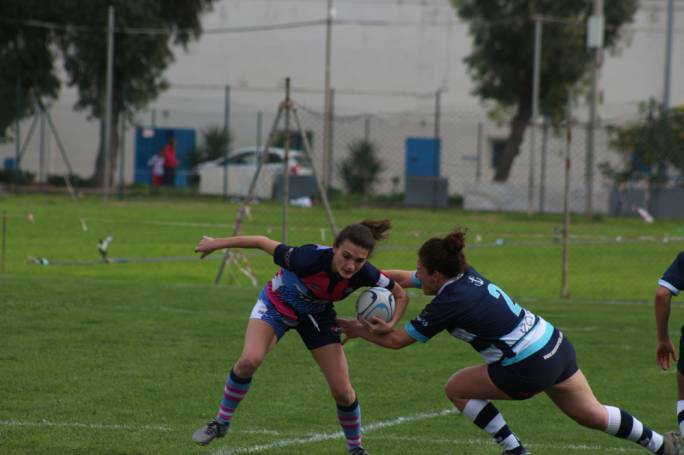 West of Overseas was yellow carded but as happened last week, when a man down Overseas raised their game and neat, accurate passing put Mifsud-Bonnicci in for a try. Attard kicked a penalty for Stompers to add to the lead, and finally they scored a rather lucky try by Boulais who picked up a dropped ball, again converted by Attard. 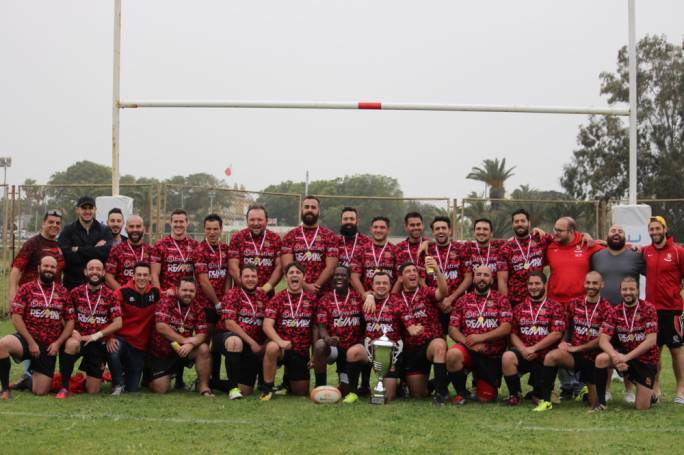 Stompers deserved this on the day and no-one played better than Max Galea who played an excellent scrum half game asa constant hub in the centre of all their efforts.